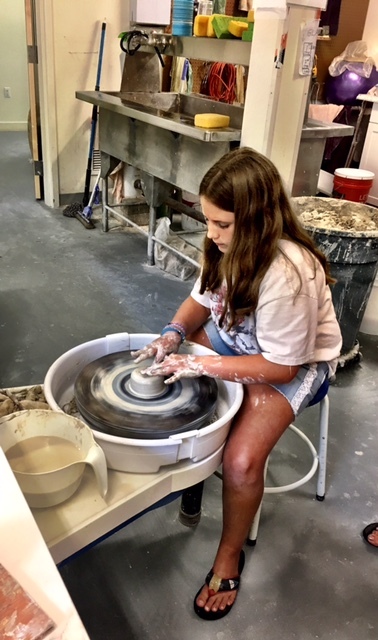 This week long clay camp is designed for students who are new to the wheel as well as those who have prior experience. Parent or Guardian * Please provide the name of the child's parent or guardian. Phone * Please provide the phone number of parent or guardian. Working on the pottery wheel, we’ll create functional wares for use at home! Whether you are new to the wheel or have some experience we’ll keep developing your skills to push you to the next level! You might want to bring a snack and dress to be messy. Kim Sheerin graduated in 1996 from the University of New Hampshire with a degree in Studio Arts with a focus in ceramics. 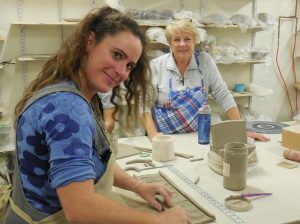 She has lived and made pottery in Pocasset on Cape Cod for the past 20 years at The Barn Pottery on Barlow’s Landing Road. Kim makes functional pots – plates, mugs, cups, bowls, and teapots – what she calls “art for every day.” Her work is highly decorated with slip trailing, stamping and sgraffito. She is influenced by the natural world of Cape Cod and by Islamic and East Indian art. She has traveled to India to investigate human trafficking there and to see how young women are being rehabilitated from slavery. Her “pots with a purpose” educate the viewer on that issue.